Shards is a wonderful book. Part homage, part translation (from the language of pottery into the language of poetry), and all lyric, all lucid, and all alive. The gift of Ann Holmes’ art is to seem artless. In poems as plainspoken and trustworthy as a wise friend, Holmes gives a memorable, often hilarious account of her pottery apprenticeship in Mashiko, Japan. She tells of her leap into a strange new world in language stripped down to its essence. As useful and cleanly shaped as the clay objects Holmes writes about, these wry, intelligent poems take us into the poet’s confidence, and every line rings true. 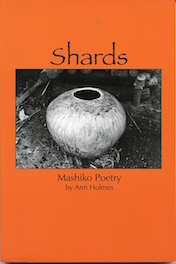 Shards is a poetry-memoir on the potter’s life in Japan, illustrated with photographs by the author. The setting is the pottery village, Mashiko, located a hundred miles northwest of Tokyo. Poet Ann Holmes lived in Japan for six years. During this time, she interviewed and photographed Mashiko potters, and later returned there to study pottery. The collection is divided into two parts, “Clay” and “Potters.” “Clay” relates the experience and perceptions of a fifty-year-old woman apprentice. In “Potters,” the poet has magically transformed the potters’ words and stories into a lyrical tribute which penetrates the heart of Japanese culture. Ann Holmes, poet and painter, was born in Chicago, Illinois, and lives in Westport, Connecticut. She attended Bennington College, and received a BA from Sarah Lawrence College. After earning her Doctorate in Art Education from New York University, she returned to Sarah Lawrence for an MFA degree in Poetry. Her poems have appeared in Asian Pacific Journal, Japanophile, Connecticut River Review and other journals.